Microsoft just released its Product Development Road map for SharePoint, providing some really interesting insight into where they are going with it and why we should bother to buy software assurance. I’m convinced that one day SharePoint will be a Skynet-like artificial intelligence program that cracks insensitive jokes at the Christmas party, but the SharePoint Road map, disappointingly, doesn’t go that far out. It does, however, talk through what has launched, what is rolling out, what is in development, and what will never be. The road map will be updated as features roll out, but as of July 2014, here are some highlights. PowerMap is now available for Office 365 users. If you your desktop copy of Excel comes through your Office 365 subscription, you’re no longer left out in the cold with PowerMap. Power View forecasting is now available for Power BI in Office 365. Document Conversations for OneDrive for Business and SharePoint Online– This is awesome. 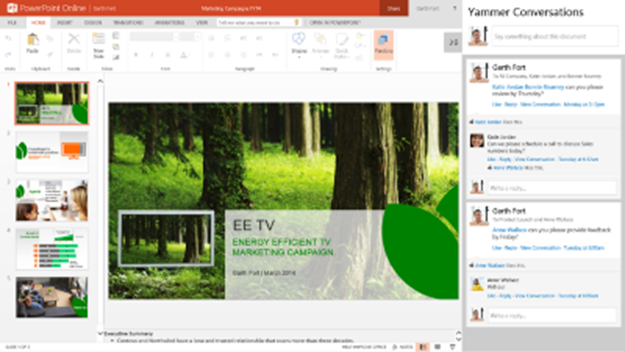 Users can now chat about a document using Yammer features right from the Office Online web app. OWA for Android– Finally Android users know the love of having their own Native App. Smart Search in OneDrive for Business – Improved search results, search suggestions, and history is now available in OneDrive for Business. Clutter for Outlook Web App – Clutter removes less important email from your primary inbox and puts it into a separate view. It’s like a light spam filter. Oslo & Office Graph – Arguably the most important development in years, Oslo will one day search through the entire O365 site and suggest data that will be interesting to you. It’s the first attempt to use the Office Graph. Document Collaboration in Outlook Web App – Open a document from email and edit it side-by-side with the original conversation using Office Web Apps. The user can then send the edited version back in an email or as a link. Office 365 Video – Microsoft wants your videos too. Upload them into OneDrive and stream them across devices.